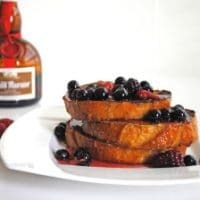 My very first subscription to a food magazine was Bon Appetit in July 2008, it was the BBQ issue, but the very first recipe I couldn’t wait to try was this version of French toast, which is one on my most favorite breakfast time meals! My husband and I have always made this recipe with different variations adding cinnamon and nutmeg, however, I now have my lovely niece staying with us for the summer and well…..she is allergic to cinnamon. So this time we stayed true to the recipe and it was still just as decadent as the very first time I made it. You don’t even need to soak the bread overnight for this recipe. And no need for maple syrup, the fresh berry compote has all the sweetness it needs. Enjoy! Bring the orange juice, sugar, and rum to a boil in a heavy large saucepan, stirring to dissolve the sugar. Stir the cornstarch and 2 tablespoons water in a small bowl to dissolve. Add the cornstarch mixture to the orange juice mixture and boil until thickened slightly, stirring constantly, about 1 minute. Add the berries. Reduce the heat to medium and stir until the berries are softened and are heated through, about 3 minutes. Preheat your oven to 250 degrees. Whisk the first 4 ingredients in a large bowl to blend together, then whisk in the fresh orange juice. Transfer to a 15x10x2 baking dish. Add the bread slices to the egg mixture and turn to coat. Let stand until bread absorbs most of the egg mixture, at least 5 minutes and up to 15 minutes turning bread occasionally. Heat a griddle over medium heat. Brush the griddle with melted butter. Working in batches, cook French toast until browned and cooked through, about 3 minutes per side. Place on a rimmed baking sheet and transfer to the oven to keep warm. 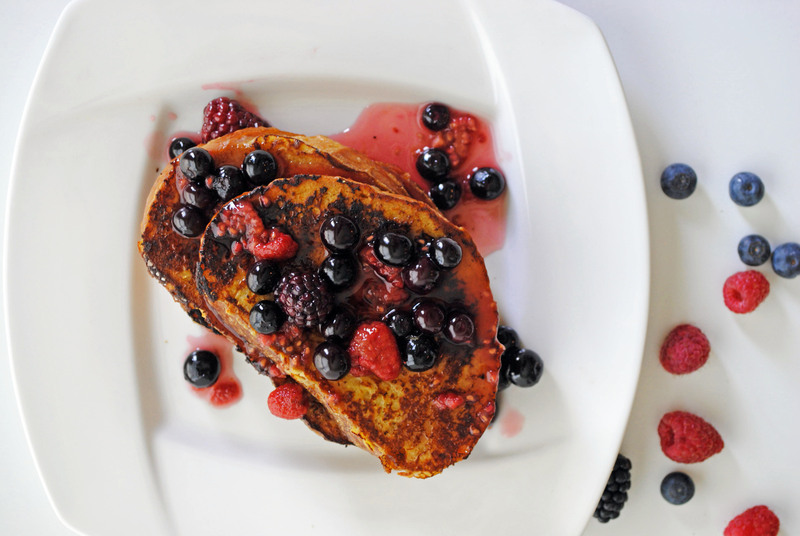 Divide French toast among plates. Spoon berry compote over and dust with powdered sugar if you wish. that looks crazy good! 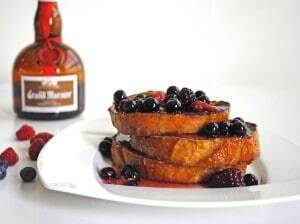 I love Grand Marnier and much prefer fruit compotes to syrup. I will be making this soon! Let me know how it comes out! Thanks for stopping by.